First impressions are important . There’s no denying it, especially when you are debuting a brand new dance company in a city that has an abundance of them. There are many ways to make a great first impression, but often, the best way to do so is to stay true to who you are and to step into the light with a kind and open heart. This is exactly what Founder and Artistic Director of South Chicago Dance Theatre, Kia Smith did. This past May, Smith curated SCDT’s first evening-length performance at University of Chicago’s Mandel Hall. What may not be immediately clear is that Smith is an exceptional leader with the patience, fortitude, and creativity that will encourage the growth of SCDT and enrich each of the communities it touches. [Brown] challenged me to accept that which makes my dancing different, which in turned freed me to express myself without the hindrance of judgement or comparison. “Mythology” is a solo work commissioned this season by California-based choreographer and dance scholar Bernard Brown. In “Mythology”, Brown uses his Africanist aesthetic to pay homage to women of color. The original score consists primarily of bass and piano was written for the work by Steven T. Gordon. During my time at the Lula Washington Dance Theatre, Brown was (and still is) a mentor and close friend. Our time in the studio shaped my ability to process movement and helped me to gain an understanding of my unique place in the dance world. He challenged me to accept that which makes my dancing different, which in turned freed me to express myself without the hindrance of judgement or comparison. Brown’s commitment to the craft and his artistry motivated me to be my best and most authentic self. One of the most memorable pieces of choreography I’ve ever danced was a trio of Brown’s, “Break”, so naturally I wanted him to create something for the SCDT. Our time in the studio shaped my ability to process movement and helped me to gain an understanding of my unique place in the dance world. The piece was originally created over a four day rehearsal period during the International Association of Black’s in Dance conference in Los Angeles for me. As the season progressed, I realized how challenging it would be to direct, produce, stage manage and dance in the show and decided to give the piece to SCDT soloist Kristi Licera. It was a difficult decision to make due to my personal connection to the work, and also a defining moment. I realized how much more joy I have as a director watching the company perform than I ever had being on stage. “May” is a product of the SCDT’s effort to preserve historic dance work, and originally premiered in 1998 at the first ever Duets For My Valentine at Chicago’s Athenaeum Theatre. Choreographer August Tye chose Samuel Barbers infamous “Adagio For Strings” to compliment this graceful pas de deux. I began training with August at the Hyde Park School of Dance (HPSD) when I was sixteen years old. I did not have the resources to study dance at a pre-professional studio such as the HPSD, and August was gracious enough to offer me a scholarship. She has been a permanent fixture in my life since, and we recently honored her with our first ever Cultural Hero Award. Duets for my Valentine is an annual performance event where Chicago based dance companies come together to celebrate Valentine’s Day with unique and fun duets of various styles. It is an event that the community looks forward to every year, and we were excited to have this piece of history as a part of our repertoire. [Yatkin’s] eclectic performance, choreographic and teaching background enabled her to work with three very different dancers to create a cohesive piece of choreography. Nejla Yatkin, one of Dance Magazine’s 25 to Watch, created an original work for the company; “The Edge of the Unknown”. The trio, set to Martin Jacoby’s “Opening”, showcases Yatkin’s unique contemporary approach to movement and takes the audience on each dancer’s individual journey. Yatkin began working with the SCDT in August of 2017 on her evening length outdoor piece “Dancing With the Garden of the Phoenix” as a part of the city’s Night Out in the Parks concert series in Jackson Park. We were very fortunate to have been able to work with her on this project. It allowed us to have the very first performance of our inaugural season in our home; Chicago’s south side. “The Edge of the Unknown” was transposed from some of the creative work done by Yatkin during her process with us in Jackson Park. Her eclectic performance, choreographic and teaching background enabled her to work with three very different dancers to create a cohesive piece of choreography. She challenged the dancers to connect with one another and also look reflectively at themselves throughout the process. I really enjoyed watching her work with them. During the eighteen minute suite, the dancers take the audience on a journey through my parent’s life; the characters they meet, their individual experiences, and the joy of actively participating in African American Jazz culture. The finale piece, “Pathways to Retrospection”, pays homage to my parents, who both have contributed to Chicago’s Jazz Community. My father Jimmy Ellis is a world renowned saxophonist who has played with many of the greats and received a life time achievement award from the Chicago Jazz Institute. My mother spent numerous years working at The Jazz Showcase; one of Chicago’s infamous Jazz Clubs that boasts having hosted musicians such as Charlie Parker, Bill Evans and Dizzy Gillespie. As a child I grew up sneaking into the back of that club to watch the artists who were in town, and was enthralled by the music. My mother passed away many years ago, but both my mother and father’s artistic influences still play a major role in the way that I navigate the world. 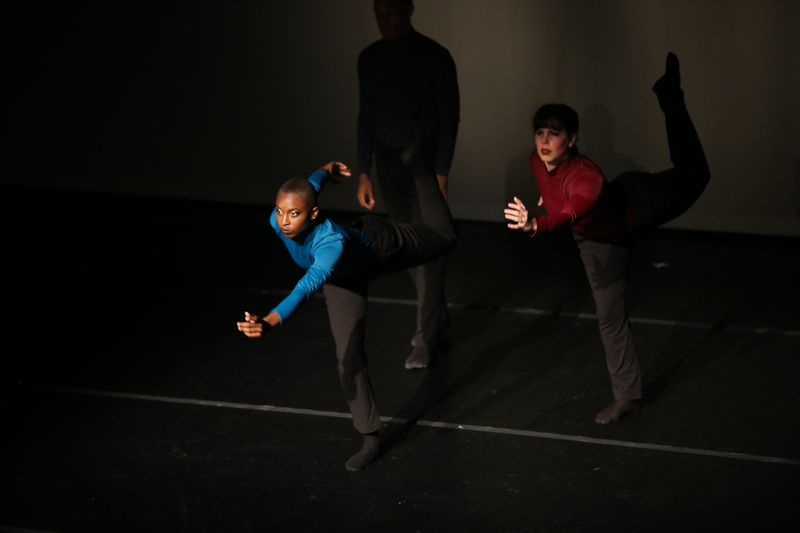 During the eighteen minute suite, the dancers take the audience on a journey through my parent’s life; the characters they meet, their individual experiences, and the joy of actively participating in African American Jazz culture. Though the SCDT is not a traditional African American dance company like many of the companies I danced for during my performance career, it is still important that I continue that to preserve and honor that lineage in my choreographic process. The movement for this work is grounded in African diasporic influences, as much of American modern and jazz dance is. Though the SCDT is not a traditional African American dance company like many of the companies I danced for during my performance career, it is still important that I continue that to preserve and honor that lineage in my choreographic process. Your next opportunity to see South Chicago Dance Theatre is as the opener for Hyde Park School of Dance’s production of Amira: A Chicago Cinderella Story. Performances take place at Logan Center for the Arts (915 E 6oth St, Chicago) June 15 at 7pm, June 16 at 1pm & 6pm, and June 17 at 2pm. Tickets are available at HydeParkDance.org/tickets. Learn more about SCDT by visiting www.southchicagodancetheatre.com.